HBO has released the first trailer for Chernobyl, it’s five-part miniseries based on the 1986 explosion at the nuclear power plant that bears the name. The series will zoom in on the lives of the men and women who acted heroically to mitigate the catastrophic damage that devastated the former Ukrainian Soviet Socialist Republic. You can check out the trailer in the post below! Jared Harris (Mad Men) portrays Valery Legasov, a leading Soviet nuclear physicist. As part of the response team, he was one of the first to grasp the scope of the unparalleled disaster that occurred. Stellan Skarsgård (Thor: The Dark World) plays Soviet Deputy Prime Minister Boris Shcherbina, who is assigned by the Kremlin to lead the government commission on Chernobyl in the hours immediately following the accident. Emily Watson (Breaking the Waves) portrays Ulana Khomyuk, a Soviet nuclear physicist committed to solving the mystery of what led to the Chernobyl disaster. RELATED: New Footage from Game of Thrones, Watchmen, Deadwood, and More Debuts! 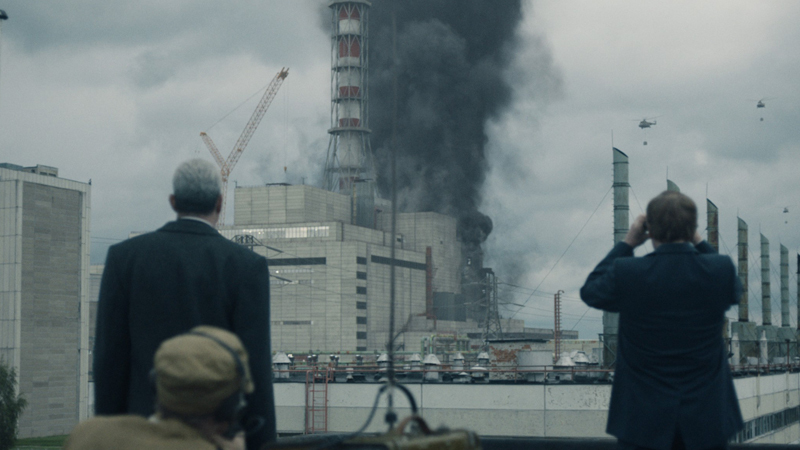 Chernobyl will also star Paul Ritter (Lovesick), Jessie Buckley (Beast), Adrian Rawlins (Harry Potter and the Deathly Hallows) , Con O’Neill (Harlots), Sam Troughton (The Ritual), Adam Nagaitis (The Terror), Barry Keoghan (Dunkirk), Ralph Ineson (Harry Potter and the Half-Blood Prince), Mark Lewis Johns (Star Wars: Episode VIII – The Last Jedi), Fares Fares (Westworld), and David Densik (McMafia). Johan Renck (The Walking Dead) will be directing Chernobyl based on the script by Craig Mazin, who will also serve as an executive producer. Sharing exec producing duties with Mazin are Carolyn Strauss and Jane Featherstone. Chris Fry will be co-executive producing along with Renck. The miniseries is produced by Sister Pictures and the Mighty Mint under the HBO and Sky co-production banner.